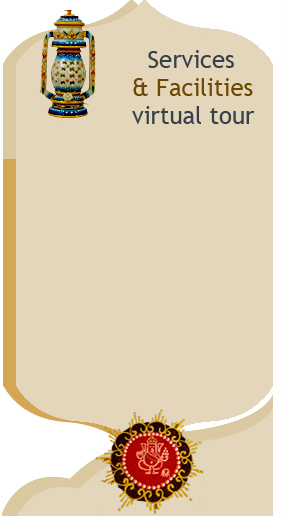 While using the site you may disclose your name, email address and some other information. Our primary goal in collecting personal information is to provide you, the user, with better responses and high interactivity. When you are on this website and are asked for personal information, you are sharing that information with Hotel Apano Rajasthan alone, unless it is specifically stated otherwise. If the data is being collected and/or maintained by any company other than Hotel Apano Rajasthan. you will be notified prior to the time of the data collection or transfer. As a general rule,Hotel Apano Rajasthan will not disclose or share any of your personally identifiable information except when Hotel Apano Rajasthan has your permission or under special circumstances, such as when Hotel Apano Rajasthan believes in good faith that the law requires it or as permitted in terms of this policy. Hotel Apano Rajasthan may also disclose account information in special cases when it has reasons to believe that disclosing this information is necessary to identify, contact or bring legal action against someone who may be violating our Terms of Service or may be causing injury to or interference with (either intentionally or unintentionally) Hotel Apano Rajasthan's rights or property, other website users, or if Hotel Apano Rajasthan deems it necessary to maintain, service, and improve its products and services. 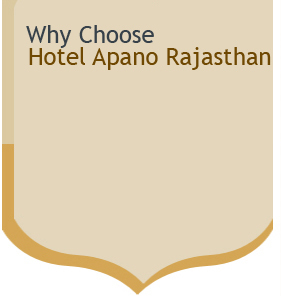 As with all information, Hotel Apano Rajasthan will never rent or sell your personal, financial or other information. Unfortunately, no data transmission over the Internet can be guaranteed to be 100% secure. As a result, while Hotel Apano Rajasthan strives to protect your personal information, Hotel Apano Rajasthan cannot ensure or warrant the security of any information you transmit to Hotel Apano Rajasthan and you do so at your own risk. Once Hotel Apano Rajasthan receives your transmission, it makes best efforts to ensure its security on its systems.